"It was in 1988. Just before my visit to Photokina, I talked with a chief editor of a Japanese photographic magazine, a friend of mine, and made a secret plan that I would take pictures of Photokina exhibition with the QV-1000C and immediately transmit them to Japan to put them on his magazine with my brief report. It was so valuable a chance to show the advantages of an electronic camera, that we could hardly give it up. So, I told the engineers who accompanied me "OK, let's go on as planned. I will take all the responsibility". After looking around the exhibition and taking pictures with QV-1000C, two engineers came to my hotel room and began the secret work. The room telephone set was almost thoroughly disassembled to connect the line from the transmitter. They called Nikon factory in Ohi, Tokyo and tried to send the pictures while talking with the engineers there. But it could not easily done because of the telephone line condition between Germany and Japan and took almost whole night until we finally succeeded." 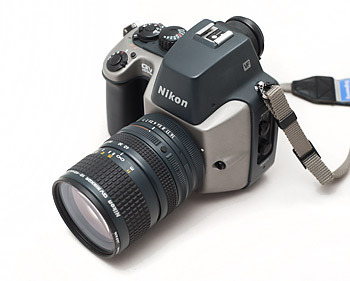 Check also some previous articles from NikonWeb about a mysterious Nikon underwater digital camera used by the Navy SEALs and how Nikon turned down Photoshop. Update: here is a sample photo taken with the Nikon QV-1000C.